This post originally appeared on AndroidAuthority.com. The Google Pixel 2 and the Pixel 2 XL don’t feature headphone jacks anymore, but to sweeten the pill, Google has a a new pair of wireless earbuds that are powered by Google Assistant. Here is our first look at the Google Pixel Buds! The Pixel Buds follow the premium design philosophy of the Pixel line and are a great looking pair of earphones. The Buds are not completely wireless however, with the two buds connected with a fabric tether that has a certain portion that loops through the earpiece. You can adjust the size of this loop to what best suits your ear size, allowing for it to sit cleanly and securely in your ear. Touch controls on the right earbud are used to enable the Google Assistant. Another very useful software feature is the ability to use Google Translate on the fly. The Translate app will have to be opened on your smartphone to listen to what the other person is saying and you will hear the translation through the earbuds. The phone app will let you translate and broadcast what you want to say as well. 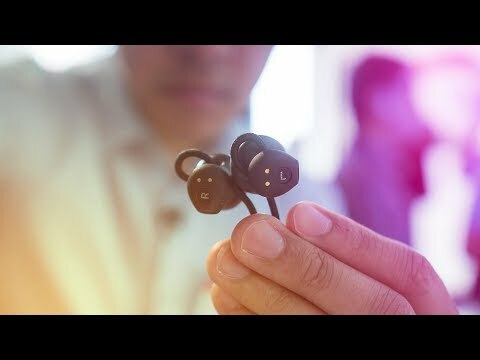 The Pixel Buds aren’t in-ear monitors, with a protruding piece that go straight into your ear canal. Even though these are non-occluding, much like the Apple Earpods, I really liked the sound quality while listening to music from the Google Play Music app during the demo. Any touch or brush of the right earbud resulted in prompts from the Google Assistant, which included information about the time and other things. You can also press the button and ask it a question as you would on your smartphone, and the relevant info will be relayed to you via the earbuds. Like the Pixel 2, the Pixel Buds are available in three different colors. The wireless earphones feature up to five hours of playback time per charge. The charging case also allows for multiple charges without needing to be plugged in every time. The Pixel Buds can be pre-ordered now for $149 with the device expected to ship at some point next month. Let us know your thoughts on the Pixel Buds and all the new Google hardware!